Is Microsoft no longer phoning it in? The leap from Windows Phone 8.1 to Windows 10 on smartphones isn't just going to be a jump in version numbers. It's going to drop "Phone" from the name entirely. This has been a huge advantage for large tablets that run full Windows instead of water-down mobile versions of the desktop software, unlike iOS 8 does with Mac OS X Yosemite. Microsoft is breaking down the Windows Phone and Windows RT borders of its operating system thanks to a version of Windows 10 that's tailored devices smaller than 8 inches. On stage, it demoed the Lumia 1520 running a new Windows 10 build. Here's what we expect from this single operating system approach on everything from mini tablets to smartphones. The first way in which Windows 10 on phones act like a grown-up operating system in through the upgrading process. It's free for the first year, just like the desktop software. That means you won't have to ditch your current Windows Phone 8.1 device in order to test out Windows 10. In fact, it'll be available to Windows Insiders starting in February. Then again, Microsoft is bound to have all-new devices running Windows 10 by the time the operating system is ready to ship. After all, that Nokia 1520 is already a year-and-a-half old. Lined with Microsoft's now-standard app tiles, Windows 10 on phones doesn't look completely different but the Start experience has been tweaked. A full-bleed background photo lies beneath the tiles, greeting you with a nice personalization feature when you swipe up from the lockscreen, something users have been clamoring for. Panning over to the right, the apps list now begins with "recently install apps" at the top. It's been promoted to make new downloads easier to find right after you hit the Windows Store. The settings menu has also been reorganized to reflect what's seen on PCs and tablets, and it looks a lot easier to drill down to the system-wide preferences that you want to change. The drive to make Windows 10 platform agnostic was best demonstrated by two of Microsoft's three flagship Office apps: Word and PowerPoint (Excel is also going to be pre-installed). 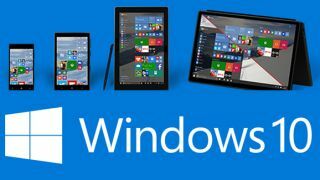 The company made the look and feel consistent on touch devices, beginning with the familiar recent documents list that roams across all of your Windows 10 systems. Opening up a Word file in page layout mode teased a shared document in the demo, but reflow mode optimized everything for the mobile editing environment. The Office ribbon that I'm now finally used to is squeezed into the app bar experience so that key elements like the formatting commands tab and review tab are easy to get to. PowerPower also has full editing tools handy, but what Microsoft was keen on demoing here was the fact that it's easy to project a rich slideshow using a phone and wirelessly via Miracast. Windows 10 is all about universal apps, from the all-new Outlook mail, Calendar and Internet Explorer-replacing Project Spartan apps that were also preview. Of course, for this to be successful, more app developers need to be more willing to serve the unified base more so than they were with Windows 8.1 and Windows Phone 8.1 separately.